Laser diffraction, Impactor, Particle size distribution, Pressurized metered dose inhaler. Pulmonary delivery is prominent way for delivering drug to respiratory tract and as a potential non-invasive administration route for the systemic and local delivery of active pharmaceutical ingredients (APIs) . The advantages are rapid onset, avoidance of the first pass effect, and higher efficiency of the delivered drug [2-5]. There are three types of formulations used for pulmonary delivery: pressurized metered dose inhalers (pMDI), dry powder inhalers (DPI), and nebulizers. pMDI is released at high velocity and requires a simultaneous inhalation by the patient, and has a widely application because of carrying portability . Commercial pMDI products include solution and suspension as the difference for physicochemical characteristics of APIs . There are many factors to influence the therapy performance , such as patient's age, flow pattern, drug aerodynamic diameter [9,10]. Many studies reported that aerodynamic diameter in the range from 0.5 to 3 μm will result in alveolar deposition; aerodynamic diameter in the range from 2 μm to 6 μm will result in tracheobronchial deposition; aerodynamic diameter greater than 5 μm will result in deposition in the upper airways. Therefore, to ensure the drug to be deposited in the lung and the range for majority of drug aerodynamic diameter must be controlled from 1 to 5 μm [11-13]. Therefore, it’s necessary to build a robust and accurate measurement of PSD for evaluation of inhaler formulation. There are many characteristic methods have been developed and mainly divided static and dynamic measurement as for the different measurement principle. The dynamic measurement is the traditional particle size analysis in the Pharmacopeia. It utilizes multiple stages impactor with progressively decreasing cut sizes to simulate the dynamic process of aerosol in lung. Then to collect the drug from different stage using suitable method and to yield mass fractions of the drug by a validated chemical detection which is a direct assessment of API [14-18]. The representative of static measurement is laser diffraction (LD) which is a rapid and noninvasive measurement of droplet diameter. The process of measurement is that aerosol particles pass through the laser beam, and then photodetector captures the intensity and angles of light diffraction pattern [19-23]. The intensity and angles are relevant to the particle size, shape, density, and other physical properties. The data of PSD is calculated by combined vector equations (Mie equation) with the incident wave, scattered wave and the wave inside the droplet. Therefore, this information is contributed to formulation development [24-26]. Although the impactor is currently considered as “golden standard” for inhaler test, the operation is labor-intensive and comparatively slow to operate compared with LD. It is necessary to sufficiently apply LD instrument to development of inhaler. However, it is still uncertain for the control of environment condition by using LD in Pharmacopeia. Many studies investigated particle diameter changes with variation in environmental conditions. Shemirani et al. studied the effect of ambient humidity on regional delivered dose with solution and suspension MDIs by using an Alberta Idealized Throat, and found that the dose delivery of pMDI formulations are affected by environmental condition. With increasing relative humidity, the deposition in mouth-throat was increase and the lung dose fraction was decrease for both solution and suspension MDIs. Increasing temperature resulted in decreased mouth-throat deposition and increased lung deposition [27-29]. Morin et al. investigated the performance of pMDIs under a variety of temperature conditions by using an Alberta Idealized Throat and the in vitro lung dose was measured by gravimetric assay. They found that when ambient temperature and device temperature were decrease, the in vitro lung deposition was decrease [30,31]. Fink et al. found that pMDI lower respiratory tract delivery rate is 16.2% under wet condition, while 30.4% under dry condition [32,33]. As we all known, the amounts of drug deposited in lung are relevant to the aerodynamic diameter [34,35]. Therefore, the variety of lung deposition may be relevant to the variety of particle size when the environmental condition changed . Presently, the environmental condition changed to affect the particle size of pMDI by using LD or NGI has not been reported [37-39]. In this study, we investigated the effect of environmental condition (temperature and humidity), flow rate and device temperature on the PSD assessment of pMDI by LD. And we also studied the effect of temperature on the PSD assessment of pMDI by NGI. The purpose of this study is to provide a reference for an accurate assessment of pMDI by either LD or NGI. We found the influence factors on particle size measurement of pMDI. Hope the Pharmacopoeia Committee of each country that will set a standard to regulate particle size measurement of pMDI. Ventolin (Salbutamol sulfate Aerosol, Propellant: HFA134a, White or almost white suspension, 100 μg*200 press), Manufacturer: Glaxo Wellcome S.A.; Atrovent (Ipratropium Bromide Aerosol, Propellant: HFA134a, Clear transparent liquid, 20 μg*200 press). Two commercial pMDI particle size distribution was measured by a Spraytec LD (Malvern instruments, UK) at different system temperatures, humidities, test flow rate and Device temperature. The LD with the inhalation cell was placed in the chamber (JinLiXin Ltd., China) which can control temperature. The chamber also has the humidity controller. System temperature variables: (5°C, 25°C, 40°C, humidity: RH 30%-50%, flow rate: 30 L/min); Humidity variables: (45%, 90%, system temperature: 25 ± 2°C, flow rate: 30 L/min). Before the experiment, in order to reach the system temperature or humidity, the system was incubated for 4 h. Flow rate variables: (0, 15, 30, 40, 50 L/min, system temperature: 25 ± 2°C, humidity: RH 30%-50%). Device temperature variables: (25°C, 40°C, 60°C, flow rate: 30 L/min, system temperature: 25 ± 2°C, humidity: RH30%-50%). pMDI device was placed in the (Shanghai YiHeng Scientific Instrument Co., Ltd.) for 4 h to an equilibrium. The pMDI was joined with an adaptor to the inlet of a USP throat which above the inhalation cell. Vacuum pump (HCP5, COPLEY Scientific, UK) was connected to the outlet of the inhalation cell. Before the test, shake the pMDI for 5 s, and connect to the USP throat, discharge 1 immediately (Each new pMDI by firing to discard the first 5 spray). Repeat the procedure. The number of discharge was 3 times (n=3). Important parameters Dv (50) (the particle size below which 50% of the aerosol) was recorded LD Software. The pMDI was joined with an adaptor to the inlet of the NGI (COPLEY Scientific, UK). The NGI was operated at 30 L/min by the vacuum pump. Before the test, shake the pMDI for 5 s, and connect to the USP throat, discharge 1 immediately (Each new pMDI by firing to discard the first 5 spray). Repeat the procedure. (Ventolin: n=10; Atrovent: n=30 (To reach the HPLC quantitative line). The samples were collected by ultrapure water (Mili-QA10, USA) and assayed to quantify Ventolin and Atrovent deposition in the USP throat and each NGI collection cups. Quantitative analysis was performed by HPLC. NGI important parameters: MMAD (Mass median aerodynamic diameter), GSD (Geometric standard deviation) and FPF (Fine particle fraction) were calculated by CITDAS software (COPLEY Scientific, UK). The sample collected from NGI was analyzed by HPLC (LC-20A, Shimadzu corporation, Japan). Ventolin: Chromatographic column: XDB-C18 (Agilent, 150 × 4.6 mm, 5 μm); Mobile phase: 0.08 mol/L. sodium dihydrogen phosphate solution (pH 3.10 ± 0.05) and methanol (85:15, v/v); UV detection wavelength: 276 nm; Flow rate: 1.0 mL/min; Injection volume: 20 μL; Column temperature: 40°C; Injection time: 5 min. Atrovent: Chromatographic column: XDB-C18 (Agilent, 150*4.6 mm, 5 μm); Mobile phase: 0.012 mol/L Sodium 1- heptanesulfonate solution (pH 3.20 ± 0.05) and acetonitrile (78:22, v/v); UV detection wavelength: 210 nm; Flow rate: 1.0 mL/min; Injection volume: 20 μL; Column temperature: 40°C; Injection time: 15 min . Using the software (SPSS 20.0, SPSS Inc., Chicago,USA) to get analysis of significant results. As shown in Figure 1, Ventolin: Dv(50) tested at 40°C increased by 37.57% and 33.47%, respectively, compared with at 25°C and 5°C. It was a highly dominant difference, but no significant difference between at 25°C and 5°C. Atrovent: Dv(50) tested at 40°C and 25°C increased by 47.99% and 47.59%, respectively, compared with at 5°C. It was a highly dominant difference, but no significant difference between at 25°C and 40°C. Figure 1. 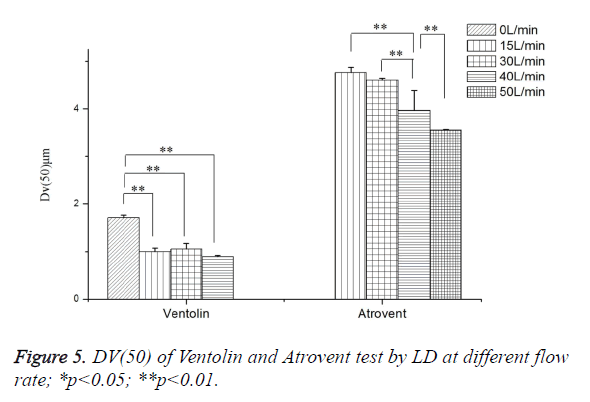 DV(50) of Ventolin and Atrovent test by LD at three system temperatures. As shown in Figure 2, Ventolin: there were no 0.1-1 μm small particles at 3 temperatures of 5°C, 25°C and 40°C. And there was a phenomenon that the maximum peak increases first and then decreases with increasing temperature. Atrovent: there were 0.1-1 μm small particles at 3 temperatures. And the maximum peak curve shift right with increasing temperature. Figure 2. 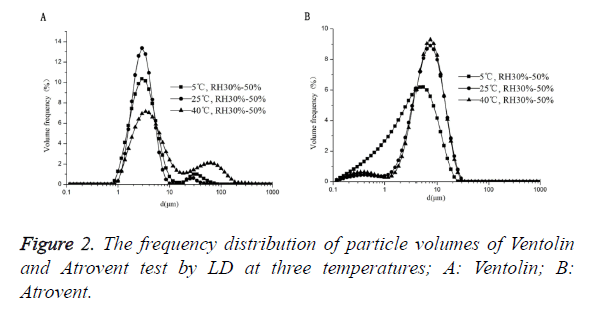 The frequency distribution of particle volumes of Ventolin and Atrovent test by LD at three temperatures. As shown in Table 1, FPF and MMAD tested between 5°C and 25°C have a highly dominant difference. MMAD tested at 5°C increased by 38.14% (Ventolin), 73.75% (Atrovent), respectively, compared with at 25°C; FPF reduced 36.13% (Ventolin), 36.22% (Atrovent). Table 1. The value of MMAD and FPF tested by NGI at 5C and 25C. As shown in Figure 3, Dv(50) tested at RH 25 ± 1.3% increased by 23.29% (Ventolin) and 34.58% (Atrovent), respectively, compared with RH>90%. Both were a highly dominant difference. Figure 3. DV(50) of Ventolin and Atrovent test by LD at two humidities. As shown in Figure 4, Ventolin: there was 0.1-1 μm small particles at RH>90%. The maximum peak curve shift right with reducing humidity, and the 0.1-1 μm small particles disappeared at RH25 ± 1.3%. Atrovent: there were 0.1-1 μm small particles at 2 humidifies. And the maximum peak curve shift right with reducing humidity. Figure 4. 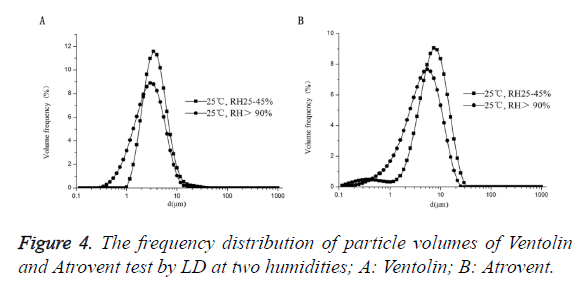 The frequency distribution of particle volumes of Ventolin and Atrovent test by LD at two humidities. 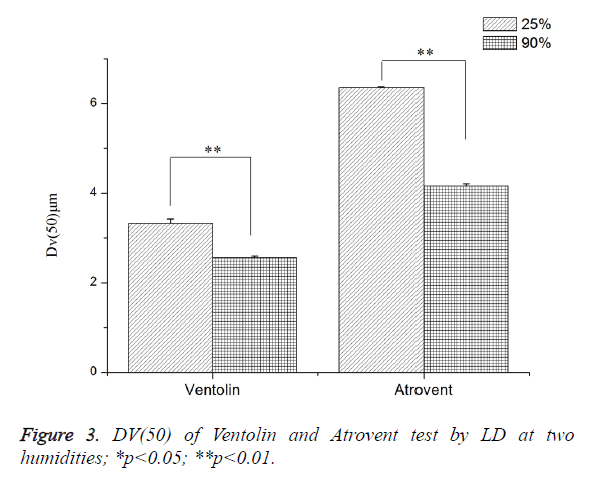 As shown in Figure 5, Ventolin: Dv(50) tested at 0 L/min increased by 47.51%, 38.25% and 41.48%, respectively, compared with at 40 L/min, 30 L/min and 15 L/min. It was a highly dominant difference, but no significant difference between at 40 L/min, 30 L/min and 15 L/min. Atrovent: Dv(50) tested at 40 L/min decreased by 16.84% and 13.80%, respectively, compared with at 15L/min and 30L/min. It was a highly dominant difference. Dv(50) tested at 50 L/min decreased 11.56%, compared with at 40 L/min (highly dominant difference), no significant difference between at 30 L/min and 15 L/min. 0 L/min cannot trigger the measurement. Figure 5. DV(50) of Ventolin and Atrovent test by LD at different flow rate. As shown in Figure 6, Ventolin: there were 0.1-1 μm small particles at 4 flow rates of 0 L/min, 15 L/min, 30 L/min and 40 L/min. And the ratio of 0.1-1 μm small particles increased with increasing flow rate, the maximum peak curve shift left with increasing flow rate. Atrovent: there were 0.1-1 μm small particles at 2 flow rates of 15 L/min, 30 L/min. There were no 0.1-1 μm small particles at 2 flow rates of 40 L/min and 50 L/ min. And the maximum peak curve shift left with increasing flow rate. Figure 6. 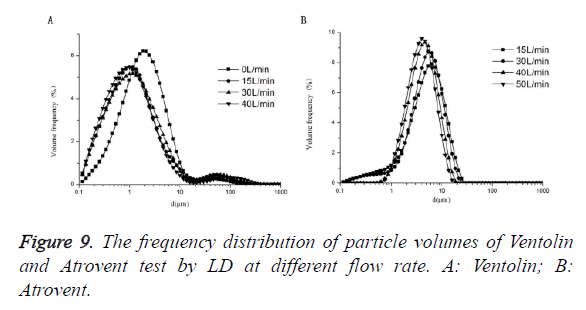 The frequency distribution of particle volumes of Ventolin and Atrovent test by LD at different flow rate. As shown in Figure 7, Ventolin: Dv(50) tested at 40°C increased by 63.10% and 62.25%, respectively, compared with at 25°C and 60°C. It was a highly dominant difference, but no significant difference between at 25°C and 60°C. Atrovent: Dv(50) tested at 25°C increased by 29.76% and 27.62%, respectively, compared with at 40°C and 60°C (highly dominant difference). Dv(50) tested at 60°C increased 2.96%, compared with at 40°C. Figure 7. 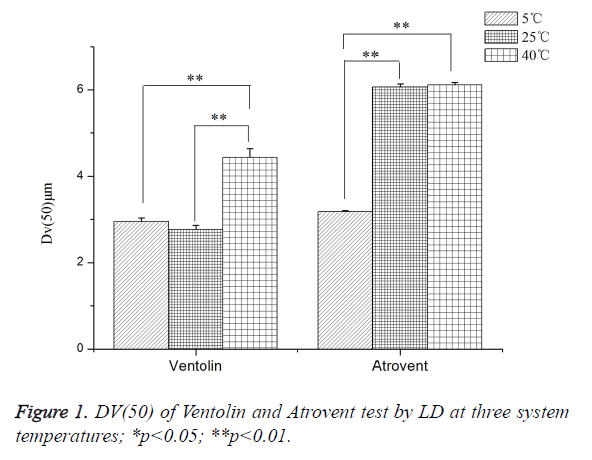 DV(50) of Ventolin and Atrovent test by LD at three device temperatures. As shown in Figure 8, Ventolin: there was 0.1-1 μm small particles at the temperatures of 25°C, but no at 25°C and 60°C. And the maximum peak curve shift left with increasing temperature, but shift right when the temperature increased to 60°C. Atrovent: there were 0.1-1 μm small particles at 3 temperatures of 25°C, 40°C and 60°C. And the maximum peak curve shift left with increasing temperature, but shift right when the temperature increased to 60°C. Figure 8. 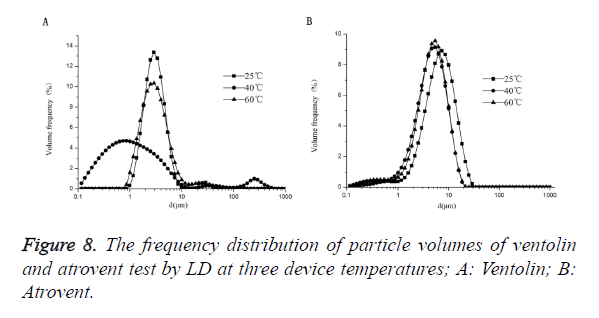 The frequency distribution of particle volumes of ventolin and atrovent test by LD at three device temperatures. At present, it is not clear how to control the environmental condition (temperature and humidity), flow rate, and device temperature when measured pMDI particle sizes by LD (Spraytec). Although it is recommended that NGI must be precooled at 5°C for at least 90 min to reduce the bias and variability caused by heat transfer-related evaporation when measured nebulizer particle size by NGI. However, the control of test condition is uncertain for pMDI by using NGI [30,41]. As for our results, these factors (environmental temperature and humidity, flow rate, and device temperature) had significant influence on the performance of LD or NGI, and should be controlled in the particle size measurement of pMDI. As described in Figure 5, there are large influences on the droplet particles with temperature increased. Although the extent is difference for suspension and solution formulations. As for the excipients content are different for formulations. Small particles (0.1-1 μm) were all not detected at three temperatures for Ventolin. However, those small particles were detected for Atrovent at three temperatures. In addition, as to our study, the results of pMDI particle sizes are different when measured at different temperature. With the increasing of temperature, the particle sizes of Atrovent are increasing. Interestingly, the particle sizes of Ventolin are decreased when the temperature are increased from 5°C to 25°C. And with the temperature increasing to 40°C, the particle sizes are increased. The differences may be related to the composition of formulation. Ventolin is suspension and aerosol contained drug particles and propellant. So, a single actuation may produce one particle in several droplets. Propellant only droplets evaporated rapidly and leaving the residual particles to condensation. As regulated formulation manufacturing process, the drug particles should be micronized at a certain size and most of those are larger than 1 μm. Conversely, Atrovent is solution formulation and may be yielded one particle for every actuated droplet. Therefore, small particles may be detected for Atrovent and particle sizes were temperature-dependent. It corresponds to the results. But for NGI, the MMAD was reduced and the FPF increased both for Ventolin and Atrovent when comparing 25°C to 5°C. This phenomenon is attributed that during the testing, evaporation may be caused by heat transfer from the NGI to the droplet cloud. So, it was recommended that NGI must be precooled at 5°C for at least 90 min when measured the nebulised aerosol droplet size. Therefore, it is necessary to regulate the environmental condition when measured pMDI particle size by NGI [30,42,43]. As showed in Figure 7, with the increasing of related humidity, the particle sizes were decreased. The phenomenon may be attributed to that aerosol droplets are easily evoprated at low humidity (Rh25 ± 1.3%). However, the influence for Atrovent is stronger than Ventolin. The humidity decrease from RH>90% to RH25 ± 1.3%, the increase in Dv (50) on average is 30.36% (Ventolin) and 52.86% (Atrovent). At the low humidity, the small droplets are ease to vapor, causing an apparent shift to larger diameter of the PSD. So, the outcome is that measured particle sizes are increase as the humidity decrease. As described in Figure 9, the operation flow rate also had an influence on particle size of pMDI. As for the results, the particle sizes were decrease with the flow rate increase. It corresponds to Feddah’s research. The reason is that there may be a highly turbulent field when the high-velocity pMDI plume encounters slower inhalation air flow. In addition, the faster inhalation air flow is, the shorter droplet evaporation time. Apart from that, the increasing of air flow may decrease the density of droplet and to stimulate evaporation . So, it may result in decrease of particle size. There was a flow-dependent behavior for Atrovent (solution formulation). And that influence was weak for Ventolin (suspension formulation). It should relate to the difference of formulation composition, such as actuator orifice, valve design and exipencient . Figure 9. 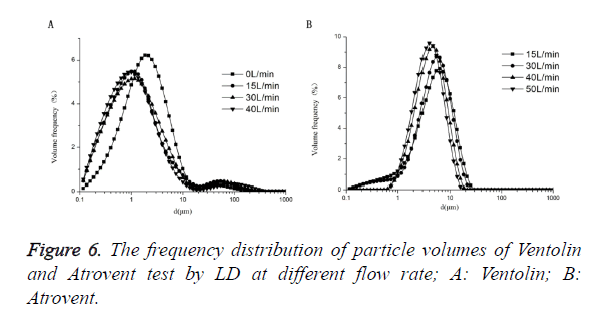 The frequency distribution of particle volumes of Ventolin and Atrovent test by LD at different flow rate. As we all known, the production of pMDI aerosol particles mainly rely on pressure of propellant evaporation. Therefore, the particle sizes depend on the pressure of propellant, diameter of actuator orifice and formulation composition. The pressure of propellant is related to temperature, actuator orifice and formulation composition, but the orifice and composition cannot be changed for a certain pMDI product . As to results, with the device temperature increase, the particle sizes were decrease at first from 25°C to 40°C and then increase from 40°C to 60°C, both for ventolin and atrovent. The change of Atrovent is weaker than Ventolin. When the temperature increase from 25°C to 40°C, the decrease in Dv (50) on average is 63.10% (Ventolin) and 29.76% (Atrovent). Then temperature increase from 40°C to 60°C, the increase in Dv (50) on average is 164.97% (Ventolin) and 3.05% (Atrovent). These differences may be attributed that propellant composition. Except for the HFA134a, the excipients of Atrovent were also included water and ethanol. But excipient of Ventolin was only HFA134a . Related study had been reported that ethanol may reduce overall formulation vapor pressure and increasing evaporation time because of much lower vapor pressure . Banga GC, KaA. Aerosol therapy. Indian J Chest Diseases Allied Sci 2008; 50: 209-219. Jaafarmaalej C, Andrieu V, Elaissari A, Fessi H. Assessment methods of inhaled aerosols: technical aspects and applications. Expert Opin Drug Del 2009; 6: 941-959. Karathanasis E, Ayyagari AL, Bhavane R, Bellamkonda RV, Annapragada AV. Preparation of in vivo cleavable agglomerated liposomes suitable for modulated pulmonary drug delivery. J Control Release 2005; 103: 159-175. Wang JY, Reid KBM. The immunoregulatory roles of lung surfactant collectins SP-A, and SP-D, in allergen-induced airway inflammation. Immunobiology 2007; 212: 417-425. Hirst PH, Pitcairn GR, Weers JG, Tarara TE, Clark AR, Dellamary LA. In vivo lung deposition of hollow porous particles from a pressurized metered dose inhaler. Pharmaceutical Res 2002; 19: 258-264. Le Brun PP1, de Boer AH, Heijerman HG, Frijlink HW. A review of the technical aspects of drug nebulization. Pharm World Sci 2000; 22: 75-81. Stein SW, Myrdal PB. A theoretical and experimental analysis of formulation and device parameters affecting solution MDI size distributions. J Pharm SCI-US 2004; 93: 2158-2175. Rahmati H, Ansarfard F, Ghodsbin F, Ghayumi MA, Sayadi M. The effect of training inhalation technique with or without spacer on maximum expiratory flow rate and inhaler usage skills in asthmatic patients: A randomized controlled trial. Int J Community Based Nurs Midwifery 2014; 2: 211-219. Guo C, Gillespie SR, Kauffman J, Doub WH. Comparison of delivery characteristics from a combination metered-dose inhaler using the Andersen cascade impactor and the next generation pharmaceutical impactor. J Pharm SCI-US 2008; 97: 3321-3234. Clancy K. British guidelines on the management of asthma. Thorax 2004; 59: 81-82. Nagao LM, Lyapustina S, Melinda MK, Capizzi MD. Aspects of particle science and regulation in pharmaceutical inhalation drug products. Cryst Growth Des 2005; 5: 2261-2267. Stein SW, Gabrio BJ, Oberreit D, Hairston P, Myrdal PB, Beck TJ. An evaluation of mass-weighted size distribution measurements with the model 3320 aerodynamic particle sizer. Aerosol Sci Tech 2002; 36: 845-8454. Mitchell J, Newman S, Chan HK. In vitro and in vivo aspects of cascade impactor tests and inhaler performance: a review. AAPS PharmSciTech 2007; 8: E110. Kamiya A, Sakagami M, Hindle M, Byron PR. Aerodynamic sizing of metered dose inhalers: an evaluation of the andersen and next generation pharmaceutical impactors and their USP methods. J Pharm SCI-US 2004; 93: 1828-1837. Mitchell JP, Nagel MW. Cascade impactors for the size characterization of aerosols from medical inhalers: their uses and limitations. J Aerosol Med 2003; 16: 341-377. Roberts DL, Mitchell JP. The effect of nonideal cascade impactor stage collection efficiency curves on the interpretation of the size of inhaler-generated aerosols. AAPS Pharm Sci Tech 2013; 14: 497-510. Kwong WT, Ho SL, Coates AL. Comparison of nebulized particle size distribution with Malvern laser diffraction analyzer versus Andersen cascade impactor and low-flow Marple personal cascade impactor. J Aerosol Med 2000; 13: 303-314. Mitchell JP, Group PPMW. Regarding the development and practice of cascade impaction testing, including a mass balance failure investigation tree. J Aerosol Med 2003; 16: 433. Boer AHD, Gjaltema D, Hagedoorn P, Frijlink HW. Characterization of inhalation aerosols: a critical evaluation of cascade impactor analysis and laser diffraction technique. Int J Pharmaceut 2003; 249: 219-231. Lelong N, Junqua-Moullet A, Diot P, Vecellio L. Comparison of laser diffraction measurements by Mastersizer X and Spraytec to characterize droplet size distribution of medical liquid aerosols. J Aerosol Med Pulm Drug Deliv 2014; 27: 94. Pilcer G, Vanderbist F, Amighi K. Correlations between cascade impactor analysis and laser diffraction techniques for the determination of the particle size of aerosolised powder formulations. Int J Pharmaceut 2008; 358: 75-81.
de Boer AH, Gjaltema D, Hagedoorn P, Schaller M, Witt W, Frijlink HW. Design and application of a new modular adapter for laser diffraction characterization of inhalation aerosols. Int J Pharmaceut 2002; 249: 233-245. Mitchell JP, Nagel MW, Nichols S, Nerbrink O. Laser diffractometry as a technique for the rapid assessment of aerosol particle size from inhalers. J Aerosol Med 2006; 19: 409-433. Martin GP, Macritchie HC, Zeng XM. Characterisation of a carrier-free dry powder aerosol formulation using inertial impaction and laser diffraction. pharmaceutical research. 2006; 23: 2210-2219. Triballier K, Dumouchel C, Cousin J. A technical study on the Spraytec performances: influence of multiple light scattering and multi-modal drop-size distribution measurements. Exp Fluids 2003; 35: 347-356. Annapragada A, Adjei A. An analysis of the fraunhofer diffraction method for particle size distribution analysis and its application to aerosolized sprays. Int J Pharmaceut 1996; 127: 219-227. Shemirani FM, Hoe S, Lewis D, Church T, Vehring R, Finlay WH. In vitro investigation of the effect of ambient humidity on regional delivered dose with solution and suspension MDIs. J Aerosol Med Pulm Drug Deliv 2012; 26: 215-222. Mitchell JP, Nagel MW, Archer AD. Size analysis of a pressurized metered dose inhaler-delivered suspension formulation by the API Aerosizer time-of-flight aerodynamic particle size analyzer. J Aerosol Med 1999; 12: 255. Mitchell JP, Nagel MW, Cheng YS. Use of the aerosizer ® aerodynamic particle size analyzer to characterize aerosols from pressurized metered-dose inhalers (pMDIs) for medication delivery. J Aerosol Sci 1999; 30: 467-477. Dennis J, Berg E, Sandell D, Ali A, Lamb P, Tservistas M, Karlsson M, Mitchell J. Cooling the NGI - an approach to size a nebulised aerosol more accurately. Pharmeur Sci Notes 2008; 2008: 27-30. Stein SW. Estimating the number of droplets and drug particles emitted from MDIs. AAPS PharmSciTech 2008; 9: 112-115. Morin CMD, Ivey JW, Titosky JTF, Suderman JD, Olfert JS, Vehring R, Finlay WH. Performance of pressurized metered-dose inhalers at extreme temperature conditions. J Pharm Sci 2014; 103: 3553-3559. Stein SW, Myrdal PB. The relative influence of atomization and evaporation on metered dose inhaler drug delivery efficiency. Aerosol Sci Tech 2006; 40: 335-347. Fink JB, Dhand R, Grychowski J, Fahey PJ, Tobin MJ. Reconciling in vitro and in vivo measurements of aerosol delivery from a metered-dose inhaler during mechanical ventilation and defining efficiency-enhancing factors. Am J Respir Crit Care Med 1999; 159: 63-68. Shalansky KF, Htan EY, Lyster DM, Mouat B, Tweeddale MG. In vitro evaluation of the effect of metered-dose inhaler administration technique on aerosolized drug delivery. Pharmacotherapy 1993; 13: 233. Schuschnig U. The next generation impactor (NGI): Effects of environmental conditions, impactor temperature and flow rate on particle size measurement of an aerosol using the eFlow® nebuliser. Drug Deliv Lungs 2006. Ziegler J, Wachtel H. Comparison of cascade impaction and laser diffraction for particle size distribution measurements. J Aerosol Med 2005; 18: 311-324. Hoe S, Young PM, Rogueda P, Traini D. Determination of reference ultrasound parameters for model and hydro-fluoroalkane propellants using high-resolution ultrasonic spectroscopy. AAPS Pharm Sci Tech 2008; 9: 605-611. Terzano C, Mannino F. Aerosol characterization of three corticosteroid metered dose inhalers with volumatic holding chambers and metered dose inhalers alone at two inspiratory flow rates. J Aerosol Med 1999; 12: 249-254. Song X, Hu J, Zhan S, Zhang R, Tan W. Effects of temperature and humidity on laser diffraction measurements to jet nebulizer and comparison with NGI. AAPS Pharm Sci Tech 2015; 17: 1-9. Sartori E. A critical review on equations employed for the calculation of the evaporation rate from free water surfaces. Sol Energy 2000; 68: 77-89. Haynes A, Shaik MS, Krarup H, Singh M. Evaluation of the Malvern Spraytec with inhalation cell for the measurement of particle size distribution from metered dose inhalers. J Pharm SCI-US 2004; 93: 349-363. Yu P, Kline LC, Berry J. The application of “in-flight” laser diffraction to the particle size characterization of a model suspension metered dose inhaler. Drug Dev Ind Pharm 2011; 37: 552. Feddah MR, Brown KF, Gipps EM, Davies NM. In-vitro characterisation of metered dose inhaler versus dry powder inhaler glucocorticoid products: influence of inspiratory flow rates. J Pharm Pharmaceut Sci 2000; 3: 317-324. Rao N, Kadrichu N, Ament B. Application of a droplet evaporation model to aerodynamic size measurement of drug aerosols generated by a vibrating mesh nebulizer. J Aerosol Med Pulm Drug Deliv 2010; 23: 295-302. Abdelrahim ME. Aerodynamic characteristics of nebulized terbutaline sulfate using the Andersen Cascade Impactor compared to the Next Generation Impactor. Pharm Dev Technol 2011; 16: 137.